In love for the Divine or for one whom one feels to be divine, the Bhakta feels an intense reverence for the Lord, a sense of something of immense greatness, beauty or value and for himself a strong impression of his own comparative unworthiness and a passionate desire to grow into likeness with that which one adores. The final demand of the Bhakta is simply that his Bhakti may never cease nor diminish. He does not ask for heaven or for liberation from birth or for any other object, but only that his love may be eternal and absolute. Modest and fragrant, it gives itself without seeking for anything in return. One form, the Ram tulsi, has very tiny pale greenish white bilabiate flowers with green calyces closely tiered on thin racemes, green stems and small softly pubescent green leaves. 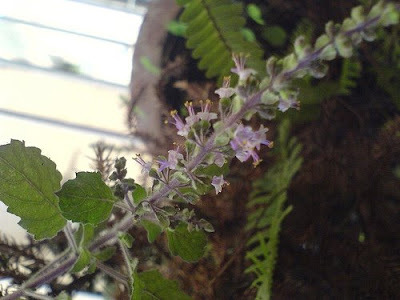 Another form, the Krishna tuisi, has very tiny pale purple bilabiate flowers with greenish purple calyces closely tiered on thin racemes, deep purple stems and leaves that are greenish purple above and green beneath. A shrubby annual or perennial culinary herb with aromatic leaves. Modest and self-effacing, it yields remarkable fruit. 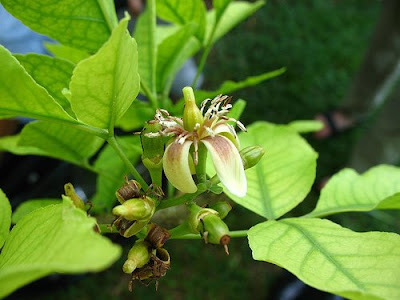 Small greenish white star-shaped flower with four or five fleshy recurved petals and a centre filled with numerous short brownish white anthers; borne in axillary panicles. 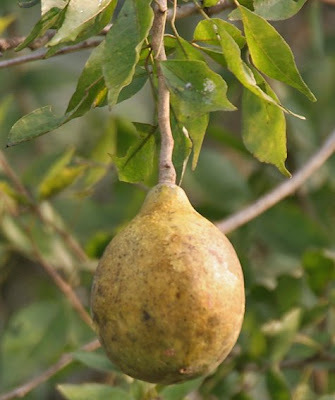 The significance also includes the trifoliate leaf and a large hard-shelled edible fruit. Small trees with sharp needlelike thorns.